Yesterday I gave up and sent the current version of our manuscript about uptake sequence variation off to my coauthors. I'm afraid I'd gotten caught up in generating more and more data, trying to fill gaps in the analysis, when what I really should have been doing was writing a Discussion. But the coauthors will do that, giving me a Discussion draft I can work on further. I'm hoping that they'll also come up with answers and suggestions for all (or at least most) of the issues I've raised in the other parts of the manuscript. Below I'm going to try to summarize the new data (new simulation runs) I've generated. Right now I can't even remember what the runs were for, and I haven't properly analyzed any of them. A. One pair of runs were two runs with 10 kb genomes that were intended to split the load of a 20 kb genome run that had stalled (needed only as one datapoint on a graph). That run had used a very low mutation rate and I was trying to run it for a million cycles, but it had stalled after 1.87x10^5 cycles. Well, it kept running, but not posting any more data so eventually I aborted it. Splitting it into two 10 kb runds didn't help - both hung after 1.87 x 10^5 cycles. Now I've made two changes. First, I've modified the 'PRINT' commands so that updates to the output file won't be stuck in the cluster's buffer; this may be why updates to the output files were so infrequent (sometimes not for weeks!). Second, I've set these runs to go for only 150,000 cycles and to report the genome sequences when they finish. This will let me use their output sequences as inputs for new runs. B. Another pair of runs were duplicates of previous runs used to illustrate the equilibrium. One run started with a random-sequence genome and got better, the other started with a genome seeded with many perfect uptake sequences and got worse. They converge on the same final score, as seen in the figure below. The rest of the new runs were to fill in an important gap in what we'd done. The last paragraph of the Introduction promised that we would find out what conditions were necessary for molecular drive to cause accumulation of uptake sequences. But we hadn't really done that - i.e. we hadn't made an effort to pin down conditions where uptake sequences don't accumulate. Instead we'd just illustrated all the conditions where they do. E. So one series of runs tested the effects of using lower recombination cutoffs (used with the additive versions of the matrix) when the matrix was relatively weak. I had data showing that uptake sequences didn't accumulate if the cutoff was less than 0.5, but only for the strong version of the matrix. Now I know that the same is true for the weak version. G. The final set of runs looked at what happens when a single large fragment (2, 5 or 10 kb) recombines into a 200 kb genome each cycle. Because there would otherwise be little mutation at positions away from uptake sequences, these runs also had a 10-fold elevated genomic mutation rate. 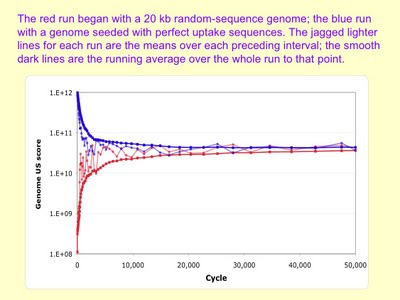 The output genome sequences do have more uptake sequences than the initial random sequences, but the effect is quite small, and the scores for these runs were not significantly different than those for the runs described in the paragraph above, where the fragments were only 100 bp. 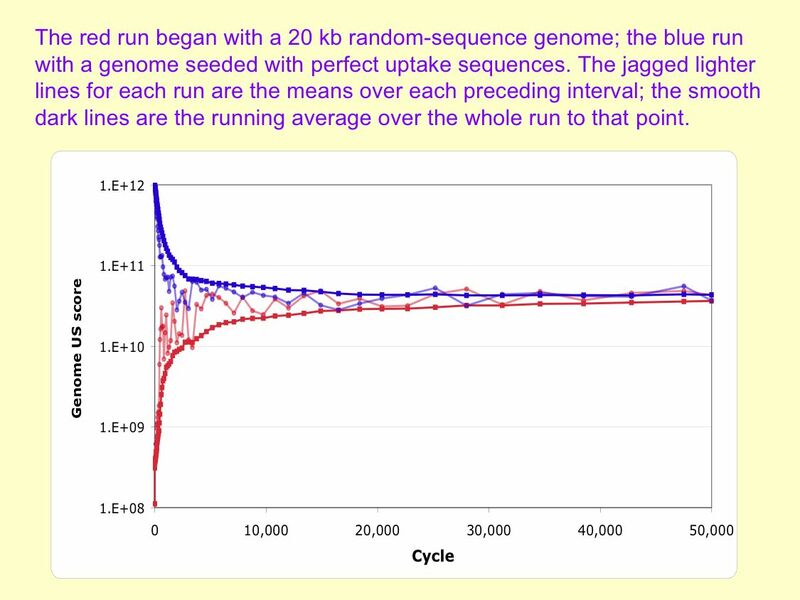 This is expected (not that I think it through) because the only difference between the runs is that this set's fragments bring in 2-10 kb of random mutations in the DNA flanking the uptake sequence.